Suburban trains F&I managers to ignite treated metal to show shoppers how strong the paint protection is. Finance Director Gary Allgeier demonstrates. Gary Allgeier, finance director at the Suburban Collection outside Detroit, likes to say his company went from "0 to 60" in the sale of vehicle-appearance protection products over the past few years. Six years ago, interior and exterior finishes accounted for less than 1 percent of aftermarket product sales in the financial services offices of the Suburban Collection, the nation's 13th-largest dealership group based on new-unit sales. Now, more than 60 percent of its customers buy appearance products. Coatings are Suburban's top seller, representing 25 percent of overall F&I department income. After a close look at why the products failed to sell, Allgeier found that salespeople were resistant because of past experience with inferior products. But now, Suburban has high-quality products prominently placed on product menus that finance managers show customers. In some cases, repeat customers come into the dealerships asking for interior and exterior coatings. "Once people buy it and take advantage of it, more than one out of two customers say they want it," Allgeier says. "They don't say they want a service contract. They don't get excited about that." Improvements in the chemicals and the coverage that comes with these products are prompting some dealers to re-emphasize the sale of appearance products such as paint sealant, fabric guard and windshield coatings. Allgeier and others also note that people are keeping their vehicles longer, while environmental damage such as acid rain has become more prevalent. As a result, demand is increasing for products that revive the vehicle's appearance. Packages offering comprehensive coverage are the hottest trend. The packages, which generally retail for $495 to $895, typically include interior and exterior coatings and protect against a range of potential hazards. The dealer cost ranges from $149 to $299 and sometimes includes customer car care kits. The interior coverage, for example, used to be limited to a few types of stains. It has been expanded to seven-year coverage for a variety of stains, such as blood and ink. The coverage is renewable after the seven years, with no dollar limit on coverage, in some cases. The premium coverage also includes burns, rips -- about any damage imaginable. Sometimes dealers throw in windshield coverage. "We sell the guarantee," says Fred Singleton, director of finance for New Port Richey Hyundai in New Port Richey, Fla. "It's a lot better product, but it wouldn't matter if you were applying water to the car as long as the guarantee is good and the vendor stands behind it." At Singleton's store, the five finance managers are required to offer interior and exterior vehicle protection. Extended service contracts and guaranteed asset protection contracts are the No. 1 and No. 2 sellers, but appearance products are a solid No. 3. At least one out of four customers purchase an Auto Armor interior and exterior protection package, and 95 percent of those who do so buy the premium package for $725, Singleton says. Lund Cadillac in Phoenix uses coatings to promote customer loyalty. The dealership applies the Solar Shield paint sealant and fabric protection to all new vehicles for just under $300, promoting the coatings as a "Preferred Owner" program. Customers value the coverage because of Arizona's extreme weather; summer temperatures can hit 120 degrees, says Matt Kinder, Lund's general manager. "We get people back in to the dealership," Kinder says. "They come back every six months to reapply the coating. It makes a 4- or 5-year-old car look brand-new." Sales manager Larry Appleby says at least 80 percent of new-vehicle buyers return for the semiannual treatments. There's no charge for the follow-up treatments, which are available for as long as the customer owns the car. "We also wash and vacuum the car," Appleby says. "It's like a mini detail" service. For Allgeier of the Suburban Collection, the greatest resistance to the product came from the sales force. He resolved that by making the coatings a perk. He had the coatings applied to demonstrator vehicles for the best salespeople and for managers. The service department's technicians also are better trained to apply the products, so there's less chance of snafus. Allgeier says the best-selling products in the finance office -- typically extended service contracts and GAP -- are never used. When they are used, it's a negative experience -- the car broke down, it was stolen or totaled. But the interior and exterior coatings are always protecting the car. It doesn't take an accident or a breakdown to justify the expense, Allgeier says. Most of the Suburban Collection's stores have high lease penetration. Lease customers see little value in a service plan, but the appearance products go over well with them. They like driving a vehicle with a showroom finish and want to maintain the appearance to avoid charges for excess wear and tear when the lease expires. Customer experiences have been so positive -- especially because of the way vehicles are protected against Michigan's harsh winters -- that Allgeier intends to record testimonials on video and put them on Suburban's Web site. 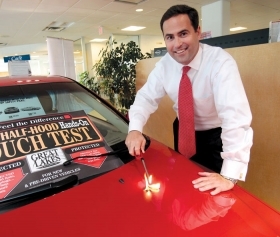 Sales prospects will get a pitch even before they reach the dealership. Vendors often supply their dealer customers with claims information to help sell the benefits of appearance products. If the coatings fail to prevent damage, the guarantee kicks in and the customer is eligible for repair or replacement of the damaged part or fabric. Laura Procida McCudden, vice president of Sundial Ltd., a Tampa, Fla., distributor of vehicle finishes, says she has provided dealers with invoices showing $2,000 to $4,000 worth of repairs for exterior bug damage. In one instance, the product guarantee covered a $1,200 seat replacement when a bloodstain would not come off a tan seat. Suburban's financial services managers are trained to do a one-minute presentation using treated metal the size of a license plate. "They light it on fire and blow it out, then we hand the customer a rag with solvent on it and [the stain] wipes right off," Allgeier says. "We use this to talk about how strong the paint protection is." Another popular demonstration is known as the "half-a-hood." The dealership treats just one-half of a hood on one vehicle in the showroom. The customer dons plastic gloves to touch and compare the surface on each side of the hood. "They can feel the difference," Allgeier says. One effective sales tool is a laminated board showing 40 types of stains that the fabric guard helps prevent, such as blood, urine, coffee and ice cream. New Port Richey Hyundai provides customers who buy appearance packages a free black bucket containing cleaning products. Each of the finance offices displays a dozen or so of these buckets stacked in a pyramid on a side wall where customers can see the display before entering. It's a simple merchandising technique, but effective. After they see the pyramids, Singleton says, many customers walk into the office and say, "I want that."